Minecraft is a modern classic. Gather resources, craft items, fight monsters and build your Minecraft world. Gather resources, craft powerful items and fight monsters. Anything is possible in the world of Minecraft. Free Game Features: - Procedurally generated open world to explore freely; - Break and place blocks to build anything you want; - Mine, gather resources, hunt, multi-task and more; - Avoid or fight monster that come out at night; - Survive and be creative, Minecraft is all about playing the game in your own way; - Create even more powerful items by combining resources; - Unlimited resources available in Minecraft Creative mode; - Build what you want - in Minecraft limitation is only your imagination. 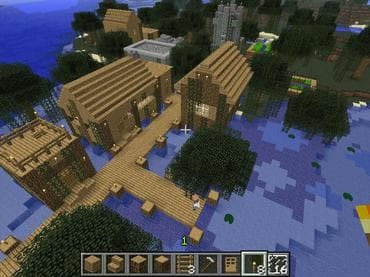 Если у Вас есть вопросы, связанные с игрой Minecraft пожалуйста используйте эту форму для связи с нами.